High blood sugar is a problem for many cats. If your kitty eats like there's no tomorrow and still loses weight, don't be jealous of her fast metabolism. There's a good chance she has high blood sugar levels. High blood sugar is the primary sign of feline diabetes, a health problem that affects approximately 1 in 400 cats. High blood sugar levels occur either when a cat’s pancreas doesn’t produce enough insulin or when her cells don’t respond to the produced insulin correctly. Insulin is a hormone that allows glucose, or blood sugar, to enter body cells so it can be used for energy. Without the proper amount of insulin, your cat’s body can’t metabolize the glucose and her blood sugar levels rise, a condition known as hyperglycemia. The primary symptoms of high blood sugar in felines are similar to those of human sufferers. Keep an eye out for excessive thirst and urination, increased appetite and sudden weight loss. Other signs of high blood sugar might include lethargy, poor fur condition and sweet-smelling breath. If your kitty exhibits any of these symptoms, make an appointment with your vet to check her blood sugar levels. Although any kitty can have high blood sugar levels, this condition is more likely to occur in obese cats who are middle-aged and older. 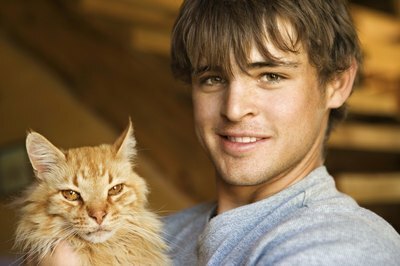 Male cats are about twice as likely to suffer from hyperglycemia as females. Pets who suffer from chronic pancreatitis, Cushing’s disease and hyperthyroidism are also more prone to high blood sugar levels. Just as with humans, untreated high blood sugar can cause numerous health problems and might even shorten your cat's life. According to Washington State University, high blood sugar levels can cause cats to develop cataracts and possibly go blind. High glucose levels can also lead to the formation of chemicals called ketones in the blood, which if left untreated can cause ketoacidosis, a dangerous and sometimes fatal condition. Signs of ketoacidosis include diarrhea, vomiting, dehydration, weakness and breathing problems. Vets diagnose high blood sugar levels using blood and urine glucose tests. If the test reveals high blood sugar, your vet will likely recommend a treatment plan that includes insulin injections or oral medications and changes in your pet's diet. Your vet will show you how to inject your cat safely, and fortunately most cats don’t object to the treatment. The Morris Animal Foundation suggests you help regulate your cat’s blood sugar by placing her on a high-protein, low-carbohydrate diet. Not only is it easier for your cat to metabolize such foods, but this diet can also help her maintain muscle even if she continues to lose weight. Sometimes obese kitties respond well enough to this diet that they don’t even need insulin. Feline Diabetes: What Is Feline Diabetes, and How Does It Affect My Pet's Health?